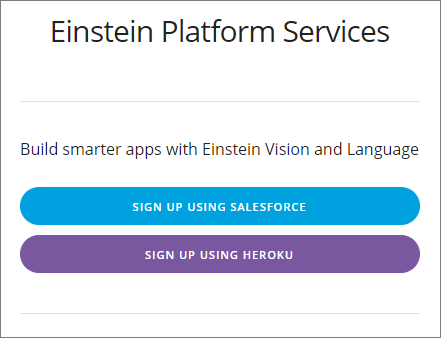 Create an Einstein Platform Services Account. Generate a JWT access token to call the API. 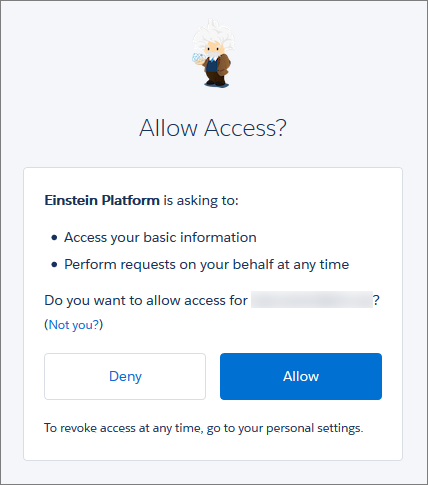 Before you can access the Einstein Platform Services APIs, you first create an account and download your key. 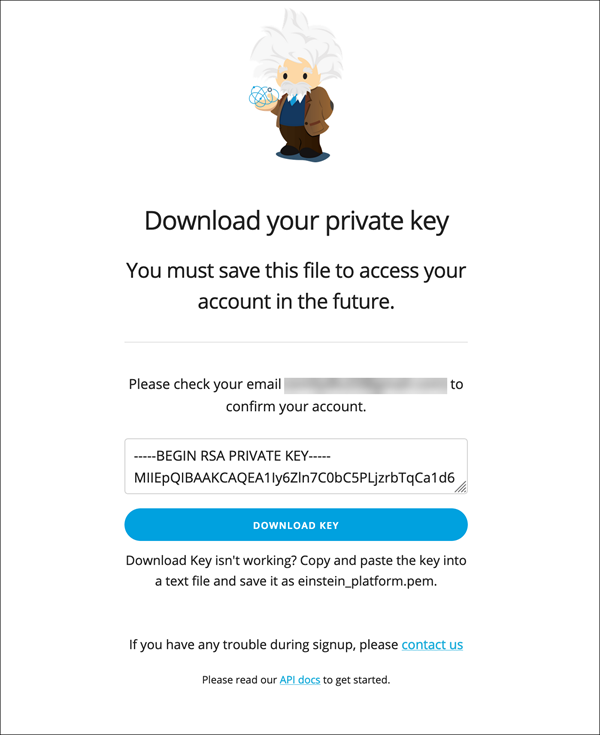 You can skip this step if you already have an account and key. If you’ve completed the Quick Start: Einstein Image Classification project or the Build a Cat Rescue App That Recognizes Cat Breeds project, you likely already have an account and key. 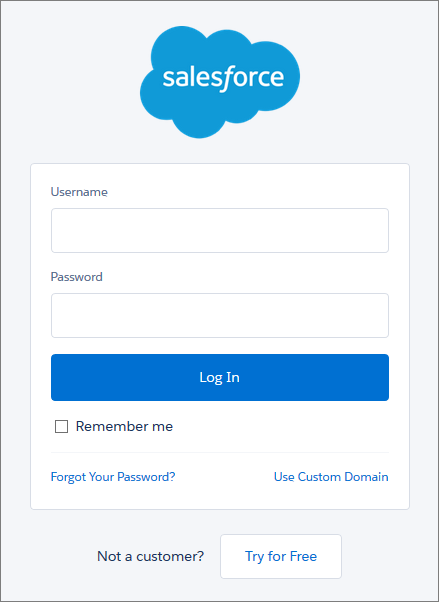 Be sure you’re logged out of Salesforce before you go through the steps to get an account. That way, you can be sure you’re giving access to the right Salesforce org when you sign up. cURL is a free command line tool for getting or sending data using URL syntax. It comes in handy when working with REST endpoints. You use cURL throughout this module to make calls to the Einstein Intent API. If you already have cURL installed, you can skip this step. The Linux or Mac OSX operating systems have cURL installed by default, but if you use Windows you have to install it yourself. To install cURL, go to https://curl.haxx.se/download.html. Download and install the version for your operating system. 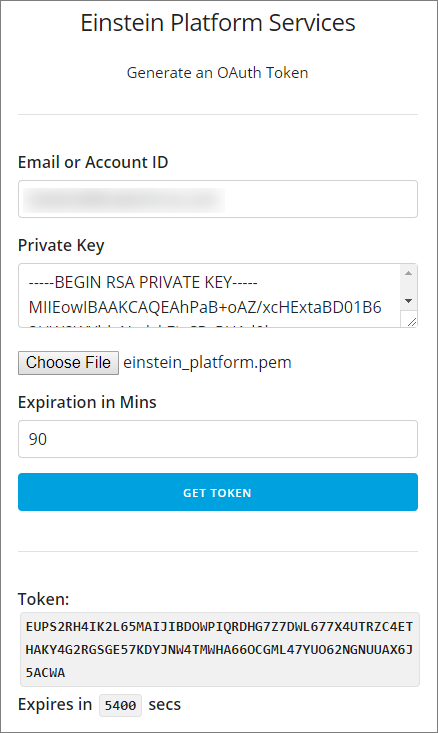 The Einstein Platform Services APIs use OAuth 2.0 JWT bearer token flow for authorization. This means that you need a valid token in each call you make to the API. When you call the API in code, you write code to generate the access token. In this module though, you use the token web page UI to generate a token. In your browser, navigate to the token page at https://api.einstein.ai/token. Type your email address. This is the email address associated with your user in the Trailhead Playground org you logged in to when you signed up for an account. Be sure to use your email address and not your Trailhead Playground username. Click Choose File or Browse and navigate to the einstein_platform.pem file you downloaded when you signed up for an account. Set the Expiration in Mins to 90. The token will expire after 90 minutes, which is enough time to complete this module. If you want your token to be valid longer, increase the number of minutes. Click Get Token, and save the token in a text file or somewhere you can access it.